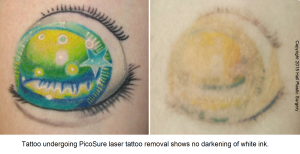 Occasionally tattoo ink will turn dark in response to PicoSure laser tattoo removal. For this reason, cosmetic tattoos, often referred to as permanent makeup around the mouth and eyes, are usually avoided. The one exception to this rule is black permanent makeup applied to the eyebrows. If the look is too stark, it can be toned down with a PicoSure laser session or two. I’ve even removed black tattoos off the scalp which had been intended to look like hair follicles on a balding head – this is a very common tattoo camouflage technique and it’s performed by an experienced esthetician. Sometimes white ink can turn dark when exposed to laser energy. Because of this, white tattoos are generally left alone. Besides, white ink is easy to cover up with a new design. But what if a standard tattoo includes white ink and the patient wants it off? Well usually I’ll treat around the white ink. If that’s not possible, such as in the example below, then a test spot can be performed to determine if the white ink is going to present a problem. Most of the time it will not turn black because the pigment simply reflects the laser energy. Take a look at the example below on a patient who is currently undergoing treatment. The white is too diffuse in the design to go around it. I performed a test spot which showed no negative reactions and then treated the entire tattoo. Bottom line: some inks will darken upon exposure to PicoSure or Q-switched lasers. When in doubt a test spot should be performed. If you would like a complimentary evaluation and a no-cost test spot to see how your tattoo will respond to PicoSure I can be reached by phone @ 512-479-9997 or just stop by my NEW location in Austin, TX: Austin Medspa on W. 6th St.